The wireless adapter allows you to cast the small screen on big screen. You can enjoy much larger screen at home while watching movies and also you can use it at office for meeting or business report. 1080 HD picture gives your exccellent viewing. Smart phone screen is not big enough when you watching videos or films or playing games. So this wireless screen converter adapter will play the role to let you enjoy much bigger screen. Featuring 1080P HD element,the screen converter provides you vivid and sharp pictures and display beautiful video and images. 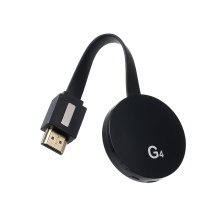 This wireless dongle support Miracast / DLNA / Airplay /Wecast four protocols. It can be used for home theater, class teaching, game playing and also company meeting. It supports many devices with WiFi function. Laptopm smart phone, tablet, TV, projector and car are also applicable. This wireless screen converter supports various Apps, such as Netflix/ iTunes/ Amazon Video/ HBO go/ Hulu Plus/ Honda Motor.